Longlisted for the Walter Scott Prize of Historical Fiction, A Petrol Scented Spring shines a spotlight on repression, jealousy and love, and the struggle for women’s emancipation. Here we are introduced to sisters Arabella and Muriel Scott as Arabella’s desire to vote fosters a burgeoning interest, and later an active role, in political protest which leads the sisters to a London jail. 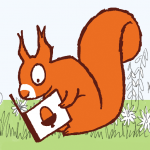 I think of her as I saw her that day in Kensington, while Bill stopped Hilda from using the hammer she had brought. That swan-like beauty. Serene amidst shattering glass. Have you ever really looked at a swan? Curiously self-conscious. They hold their lovely necks so stiff it makes my shoulders ache. But if you rile them and they go for you with their stabbing beaks, they’re not so elegant. I can’t be certain it was her. But this is my story, and hers was the face that floated into my head when I finally put two and two – or should I say, two and one – together. Hers or another’s, it doesn’t really matter. She’ll have felt the same blend of terror and elation. The suddenly-dilating capillaries. A kick-start from the adrenal gland. I went through something similar ten years later, the first time I performed an amputation, so I know how it feels to bluff your way through the unthinkable. And afterwards, to look in the glass and see the self you always hoped you’d become. How could he not fall for her? How can I not imagine myself in her shoes? Second sister in a brood of female brainboxes (with one petted baby brother) but, unlike so many other ambitious, intelligent Scotswomen, not a doctor. She can’t have been squeamish about gore, given what she put herself through, so why follow the more conventionally feminine path of teaching? Why else but ego? All those young hearts in love with her. Or am I being unfair? She was used to taking a lead. That was the difference between us. The whole country was her classroom. She would instruct, and so improve, us all. What a marvellous chance she was given: to shout and smash and insult and burn in the name of high principle. All the petty irritations, the boredom – and God knows, it was boring, being a young woman then – all of it rolled up into a great yell of injustice. She saw the opportunity, and grasped it, while I went about coveting other women’s hats, and drinking myself lightheaded on Darjeeling, and flirting with young nincompoops, thinking myself quite the heartbreaker. It starts at university. The old story. A new self. New friends. No one to pull you down, recalling that time the minister caught you watching his spaniel mounting Mrs Lawrie’s pug. If you want to be the very embodiment of high-minded intellect, who is to gainsay you? Then there’s the way your footsteps echo in the Old College courtyard, the freshness of your complexion against the grey stone, your crisp white blouse, the easy sway of your uncorseted gait, your waist so sweetly narrow in the cinch of your not-quite-ankle-length skirt. A bluestocking! A wholly new kind of woman – well, apart from lady novelists and Renaissance queens. The intellectual equal of any man, as rational and purposeful and far-sighted, but with an extra soulfulness. Born to show both sexes how far they fall short. She has never given a thought to the vote, but now that it’s been mentioned, of course she must have it. And the women who come to speak at the Suffrage Society are so much the sort of women she would like to be. So assured and passionate and imperious. And it’s such fun, getting all dressed up to carry the banner, making speeches on a soapbox, heckling members of parliament. It helps that she has her sister beside her. Dear Muriel. Clever, but not quite as clever. Courageous, but not in the same reckless way. She can’t remember a time when Muriel was not looking up at her with that admiring gaze. And part of what dear, loyal Muriel so admires is her big sister’s beauty. There’s no getting away from it: a beautiful woman can do things a plain woman had better not attempt. If it’s injustice that galls you, there’s injustice. Why should one pair of eyes, one nose, one mouth, be more pleasing than another? And not just pleasing: more aloof and unknowingly voluptuous, more like a ripe plum weighting down the branch. Muriel is a solid little thing, her lips a little thinner, her eyes a little more bulbous. Touching in her true-heartedness, but not a beauty. They share rooms while studying at Edinburgh University. They walk to lectures together. They whip each other into a frenzy of indignation over the iniquities of our so-called democratic system. They admire the English heroines who get themselves arrested and starve in gaol, but their own roles are no less necessary. Chalking on pavements, handing out membership forms, waving placards at by-election meetings. In 1909 they travel to London to deliver a petition to the Prime Minister and are arrested for obstruction and sentenced to twenty-one days in Holloway Gaol, where they refuse to eat. 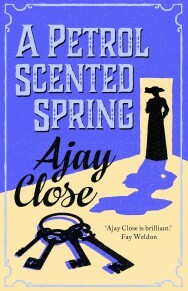 A Petrol Scented Spring by Ajay Close is out now published by Sandstone Press priced £8.99. Ajay’s new novel The Daughter of Lady Macbeth is published by Sandstone Press on 16th February priced £8.99.